Wondering How to Get Rid of Slugs and Snails in the Garden? Every gardener has a dislike for these slimy creatures that cause damage to garden plants. During the day slugs hide in cool, dark places, for example, under dead leaves, large clumps of earth, rocks, mulch, or anywhere where they can easily crawl under and hide from the heat and light. Slugs do not like sunshine. Slugs emerge from their shelters at dusk, and search for food. They are most active in cloudy conditions and after a light rainfall. They are usually a pest to the garden from April to October, and then they hibernate until the following spring. When slugs invade a garden, they can cause major damage to seedlings, roots, and full grown plants. 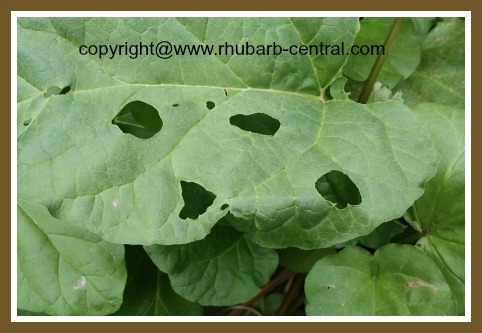 They leave behind sticky deposits (trails), and jagged holes on the edges or middle areas of the plant leaves (see image below). Obviously, the best method of slug and snail control is prevention. To help prevent these pests from damaging your garden plants, it is important to be sure to keep the garden and surrounding area free of vegetable refuse, and all other food sources. Also, remove any bricks, rocks, boards, and any other debris that is directly in contact with the soil. It is also advisable to remove fallen leaves from the garden, as they will decay and allow the slugs to shelter under them. Try not to allow the garden plants to be too dense, (it may be best to thin the plants a little), so that the sun can penetrate the area more easily. Slugs do not like the sunshine! This is a good idea to keep in mind when considering how to get rid of slugs. Water the lawn and gardens in the morning. Slugs are nocturnal, and not only can they slither through the soil more easily when the grass and gardens are wet overnight, but they love wet conditions. If the grass and gardens are watered in the morning, and allowed to dry out during the day, the conditions will be less desirable for slug pests. When slugs become a pest in the garden, some people hand pick the slugs. This method of how to get rid of slugs may be labour intensive (and yucky! ), but this method has been reported to be quite effective. (and the shiny trail they leave behind), and, using a spoon or other tool, dislodge the slugs, and place them in a container of soapy water or rubbing alcohol to destroy them. You can also place upside-down flower pots as traps around the garden to trap the slugs where they are a problem. 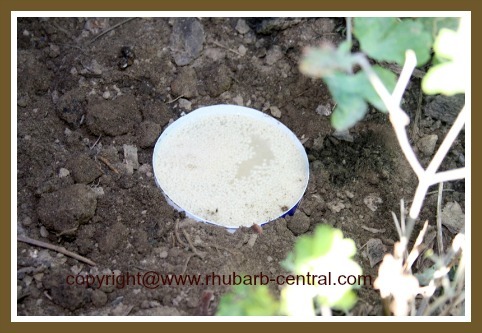 The slugs will go under the pots for protection from the sun, and then can be eliminated daily. You can also use another sort of attraction, for example melon peel, or grapefruit peel for the slugs to crawl under for shelter. Check the traps daily, and place the slugs in a container of soapy water or rubbing alcohol to destroy them. Make a slug trap with beer! This is a good way to eliminate slugs in the garden in a natural way. To make a slug trap, put stale beer, (or use a mixture of 1/2 tsp. baking yeast, 1 tbsp. sugar, and water), into a shallow dish or jar. Sink the shallow dish into the ground, so that the edge of the dish is at ground level (see image below). These slug traps should be placed about every ten feet in the garden. The slugs will be attracted to the bait, and will drown in the solution. Substances such as sand, wood ashes, baked eggshells, etc. irritate the bodies of the snails and will deter them from climbing onto plants to feed. Sprinkling a barrier of these sharp substances at the base of plants will also prove effective barriers to get rid of slugs. Tiny, sharp edges granules such as these often cut the soft-bodies of slugs, causing them to dehydrate. Toads, and other animals such as snakes, birds, and ducks are natural predators that will feed on slugs and snails. Encouraging these natural enemies to reside in your garden will help to prevent an invasion of slugs and snails. Some sources suggest that placing copper flashings, (about 2 inches high), around the borders of gardens will also help to repel slugs. The copper emits a small amount of an electric charge that helps to keep the slugs away. Most garden centers sell slug bait that, in my experience, works very effectively in controlling slugs and snails in the garden, around vegetables, fruit trees, berries, flowers, shrubs and lawns. Most of these products can be used outdoors, or in greenhouses. Many of these products are not harmful to birds, pets or wildlife and are safe for the environment, allowing a safer method of how to get rid of slugs. Check out the products below if you are interested in purchasing slug bait online at *Amazon.com. 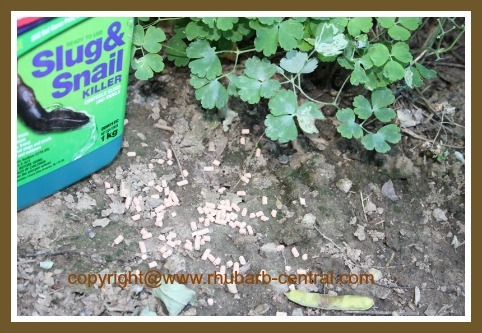 Small pellets (slug bait), sprinkled on the garden, around the plants in the evening effectively kill the slugs invading the garden at night. You will notice in the morning a trail of slime intermixed with the slub bait. With these tips on how to get rid of slugs, you should be well on your way to a garden rid of these slimy pests!